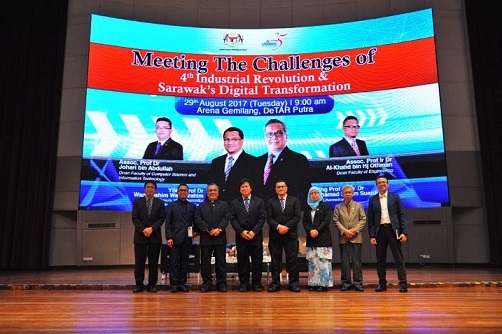 Kota Samarahan, 29 August 2017: Universiti Malaysia Sarawak (UNIMAS) conducted a seminar on Meeting the Challenges of 4th Industrial Revolution & Sarawak’s Digital Transformation at Arena Gemilang DeTAR Putra, UNIMAS today. The 4th Industrial Revolution (4th IR) will lead in an era of disruptive and exponential change, impacting all disciplines by merging together the physical, digital and biological worlds. With these changes come the new opportunities for human development, knowledge construction and cross - cultural communications. The first speaker is the Vice Chancellor of UNIMAS, YBhg Prof. Dato' Dr Mohamad Kadim Suaidi with his paper entitled ‘Overview of 4th Industrial Revolution and Sarawak Digital Transformation’ followed by the Deputy Vice Chancellor (Academics & International) YBhg Prof Dr Wan Hashim Wan Ibrahim on ‘Education 4.0 : The Way Forward’ as a second speaker. Third speaker is the Dean of the Faculty of Computer Science and Information Technology, Assoc Prof Dr Johari bin Abdullah,: ‘The 9 Pillars of Industry Revolution 4.0’ and last speaker is the Dean of the Faculty of Engineering, Assoc Prof Ir Dr Al-Khalid bin Hj Othman on ‘The Future of Jobs for Sarawak 4th Industrial Revolution Initiatives: Employment, Skills and Workforce Strategy’. This seminar is one of the events organised in conjunction with UNIMAS 25th Year Jubilee Celebration and attended by all UNIMAS academicians and officers. Additionally, officers from various government agencies are also invited to this seminar. 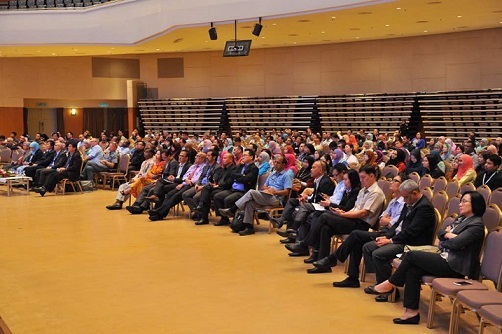 The Federal Secretary of Sarawak, Dato’ Haji Mansor bin Man and Principal Assistant Director Sarawak State Government, Puan Sharifah Rohana representing Sarawak State Secretary Tan Sri Datuk Amar Haji Mohamad Morshidi Abdul Ghani is are among the VIPs who was attending the seminar. 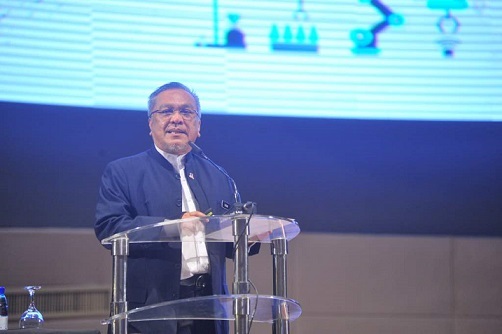 UNIMAS, as one of the Institutes of Higher Learning in Sarawak, hopes that the event will become a platform to create and enhance awareness in the area of 4th Industrial Revolution in the State.